How About If We Don't Rush Gabby Giffords Into 2012 Senate Race? : It's All Politics Sen. Jon Kyl's (R) decision to retire has resulted in a mini-upheaval in Arizona politics, with many politicians angling to run. But isn't it too soon to be speculating about a possible Gabby Giffords candidacy? How About If We Don't Rush Gabby Giffords Into 2012 Senate Race? 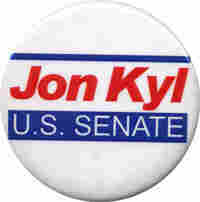 The decision by Sen. Jon Kyl (R-Ariz.) to opt out of a fourth-term bid was, to say the least, a surprise. At least to me. With the GOP having a good shot to regain the majority after next year's elections, Kyl, the number two Republican in the Senate, would have emerged with even more power and influence than he has today. Unlike the previous week's retirement announcement of Sen. Jim Webb (D-Va.), which was not unexpected, I thought Kyl, 68, was going to stick around for another six years. More than a surprise however — more of disgust really — has been the growing number of pundits who say the impending opening is a great opportunity for Rep. Gabrielle Giffords (D) to run for the seat. Excuse me? We're not talking about the same Gabby Giffords who is still recovering from last month's gunshot wound to the head, are we? The same person whose mental capacities are still uncertain, whose prognosis for a complete recovery is too soon to tell? That Gabby Giffords? The wounded congresswoman ... is reportedly making so much progress that the prospect sounds plausible, if not, as of yet, very realistic. Prior to the Tucson shootings, Giffords was viewed as one of the best the Democratic Party, in Arizona and elsewhere, had to offer. She's moderate, charismatic, and a proven fundraiser. And she had won reelection in about as tough a political environment as has existed for incumbent Democrats in a generation. As a Senate candidate, she would enjoy a national profile. Before she was shot in the head last month in Tucson, the conventional wisdom was that Giffords was a prime contender for Kyl's Senate seat. Now that Kyl is retiring, there is a genuine pickup opportunity for Democrats in the state, and Arizona Democratic Party Chairman Andrei Cherny says Giffords remains at the top of the list. "It goes without saying that even before the attack, she was at the top of everyone's list," said Cherny, who was recruited to run for the post by Giffords. "I think the things that make Gabby Giffords an attractive senate candidate are 90 percent things that have nothing to do with the tragedy in Tucson." I understand politics is politics, and some people think only in terms of politics. I can live with that. And I'm not criticizing those who want to write about it. Still, I have to tell you, hearing all this speculation about Giffords' political future creates an uncomfortable feeling in the pit of my stomach. There is no question that Giffords is an attractive and engaging politician. After all, she — unlike fellow Arizona Democratic House members Harry Mitchell and Ann Kirkpatrick, as well as many Democrats around the country — survived the 2010 campaign, albeit barely. And sure, there will be plenty of time to assess her future once we know she is better. But we don't know that yet. And while there have been encouraging statements from her doctors, we have no idea what kind of rehabilitation she will need. We have no idea what her capacity will be to think, to talk, to walk. Let's pray for her complete recovery. And if we want to talk about a Giffords Senate bid, maybe we can wait until 2016 when, one thinks, Sen. John McCain (R) will retire. But let's wait for her to come out of the hospital before we start anointing her as the Democratic great hope to win a Senate seat. It just feels unseemly. Or just plain icky. There will, of course, be no shortage of Republican candidates for the seat. Already, Rep. Jeff Flake has jumped in the race, and many give him a good shot at the nomination. But it won't be his for the asking, as others in the GOP are likely to run as well; mentioned include Rep. Trent Franks, former Rep. John Shadegg,* and J.D. Hayworth, another ex-congressman who lost to McCain in last year's primary. Another name discussed is the controversial sheriff of Maricopa County, Joe Arpaio, who in fact leads prospective GOP candidates in a poll (of questionable value) released this week. Still, before we decide the seat is a keeper for the GOP, don't forget, it was a contentious 1976 Republican primary that helped the last Democrat win a Senate race in Arizona, Dennis DeConcini. He won a third term in 1988 and Democrats haven't prevailed in a Senate race here since. And so, while my gut tells me the GOP retains the seat, let's not count out the Democrats just yet. One name constantly bandied about is former Gov. and current Homeland Security Secretary Janet Napolitano, who joined the Obama Cabinet two years before term limits would have forced her out of office. Napolitano retains high approval ratings in the state — she got a thunderous reception at the Tucson memorial service — and had reportedly been plotting out a 2010 challenge to McCain until Obama called. Another Democrat mentioned is Phoenix Mayor Phil Gordon. Other Senate retirees (thus far): Joe Lieberman (I-Conn.), Kent Conrad (D-N.D.), Jim Webb (D-Va.) and Kay Bailey Hutchison (R-Texas). From the Archives: "Speculating On Motive Behind Giffords Shooting Helps No One," (Political Junkie, Jan. 8, 2011). Ten Questions with Ken Rudin. Hey, that's me! Click here to read a nice interview with me conducted by Scott Leadingham of Quill, the magazine of the Society of Professional Journalists. Riveting reading, trust me. Talk of the Nation: Wednesday's Political Junkie segment focused on the budget battle, with special guest Sen. Kent Conrad (D-N.D.), the chairman of the budget committee. Host Neal Conan and I also talked about the meaning of Ron Paul's straw poll victory at CPAC, the startlingly quick resolution to the Chris Lee scandal, Rahm Emanuel's march to the Chicago mayoralty, the Kyl retirement decision, the latest 2012 New Hampshire primary poll that shows Mitt Romney with the lead, and Alvin Greene's impressive showing — a whopping total of 36 votes — in Tuesday's Democratic primary for a state house seat in South Carolina. The highlight of the discussion with Conrad, in my humble opinion, was my suggestion that we can solve the budget crisis by ending federal subsidies to NPR and public broadcasting. Really, that should do it. But, alas, I erred with my answer to my own trivia question. In talking about Rep. Ron Paul (R-Texas) — who ran for the GOP presidential nomination in 2008 and also was the Libertarian Party nominee in 1988, I asked who was the most recent former member of Congress who also sought the presidency under two different party banners. My answer? John Anderson (R-Ill.), who after he dropped out of the Republican contest in 1980 ran as an independent. Of course, I completely forgot Mike Gravel, the former senator from Alaska, who after he dropped out of the 2008 Democratic contest continued his effort as a Libertarian Party hopeful. Drats. I don't get the coveted t-shirt this week. Tuesday's Junkie column: Focused on Ron Paul and his propensity for winning presidential straw polls. You can read that column here. Wanna be on my weekly mailing list? Sign up at politicaljunkie@npr.org. Wanna follow my rantings on Twitter? Go to http://twitter.com/kenrudin. This Day In Campaign History: Sen. Frank Lautenberg announces he will not seek a fourth term in 2000, when he will be 76 years old. Lautenberg, a New Jersey Democrat first elected in 1982, makes it clear he had tired of the rigors of fundraising (Feb. 17, 1999). But he will be pulled out of retirement in 2002, put on the ballot at the last moment following the decision by the ethically challenged Sen. Robert Torricelli (D) to retire.